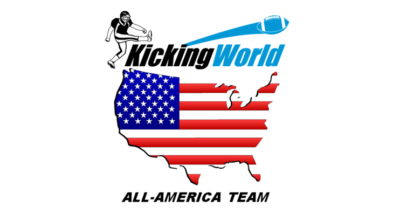 Private Kicking Lessons in Texas Pays off for High School Kicker! I'd like to tell everyone about a nice kicking improvement story from a young kicker who worked hard to get better and earn the starting high school varsity football kicker job! I’d like to tell everyone about a nice kicking improvement story from a young kicker who worked hard the last 5 weeks to get better and earn the starting high school varsity football kicker job! About 2 months ago I got a call from Mr. and Mrs. Wilks in Texas who wanted to get their son Zack some private kicking instruction. At the time Zack was a ‘straight-on kicker’ or ‘toe-baller’ if you will. He had no previous formal kicking instruction but had one goal in mind- to improve quickly enough to be able to be the varsity kicker this season as a Junior and have a fun 2 years ahead of him. Well after making arrangements, the Wilks and I set off for a mission of getting Zack game ready as soon as possible. Now a week later and after only 5 total private kicking sessions Zack has gone from just a ‘beginner kicker’ learning the ropes to a relied upon kicker who just set a school record for most PATs in a game last Friday Night! Yes, that’s right, you read correctly… Zack Wilks hit 7 for 7 PATs in this past Friday night football game! What an amazing story this is turning into! This Friday’s performance put him in the Cisco ISD Varsity Football record books for most PATs in one game. In fact, the announcers said at the game that the last time a kicker for Cisco made even 3 PATs in a game was over 3 years ago! It goes to show that even in the great football state of Texas there is a lack of speciality kicking coaches to address this niche position. I am so excited for him and look forward to continued growth and improvement from him. I thoroughly enjoy the opportunity to go out to Texas to work with Zack each month and see his dramatic and quick improvement each session with not only consistency, but impressive gains on height and distance. Zack should have a fun senior year to look forward to next year with a lot of kicking opportunities to set new school records and help Cisco ISD get back to another state championship run like they have so many times in the last 20 years. My services to any student I coach includes on-field kicking instruction, drills, technique, fundamentals, distance/heigh/accuracy improvement, off-field training in form of gym workouts, leg strengthening, leg speed drills, and of course one of the most important components of what I do with Zack and ALL my students is helping increase their confidence through mental training and guidance throughout the week. When you work with Kicking World it’s not just a quick see me for an hour and wait till next week for your next lesson. I seek to build a relationship with all my students where I offer up advice, guide them throughout the week whether they have a question about why they did bad in practice one day, or need to know a drill to help a certain area of their kicking, or if they are nervous before the big game, I can help with that too. I am not only a coach but a teacher and advice giver to my students. Having parents, coaches, and students all ‘on the same page’ is a win-win for all and makes for a healthy relationship of trust, confidence and results. It’s great to get that text message or phone call from a happy parent on Friday night to let me know their son just hit a game winning field goal!